Shin splints are a common injury affecting athletes and others who engage in running sports or other forms of physical activity. Characterised by general pain in the lower region of the leg: between knee and ankle. Recent reports suggest that it comprises 13% to 17% of all running-related injuries 2,3 . Often patients experience shin splints after being told by their General Practitioner to start walking as a means of healthy cardiovascular exercise. Shin splints are classified as an over-use syndrome due to fatigue failure at the deep fascial attachment sites of the tibia, excessive supination or excessive pronation is often an underlying causative factor. Excessive supination and the association of forefoot valgus has been linked to the lateral shin splints, whereas excessive pronation is more often at tributed and associated with medial shin splints. At mid stance, with the foot excessively pronated and the tibia internally rotated, the tibialis posterior muscle and tendon is placed under tension at its attachment to the tibia and the interosseous membrane. Repetitive stress initially produces tendonitis. The tibialis anterior and tibialis posterior muscle is partly responsible for inverting the foot and ankle in respect to the midline of the body and assisting in plantarflexion of the foot. Another function is that it helps to maintain the arch of the foot and is particularly active during weight-bearing activity such as walking and running. When training it is NOT advised that one should train through the ‘pain barrier’ of the initial shin splint type injury, as the chronic traction may produce periostitis. (Bruhner & Khan, 1993; Lorimer et al, 1997). Medial Shin Pain: usually occurs when the patient engages in prolonged walking or running uphill. The patient will feel the pain along the tibialis posterior muscle and tendon. Sometimes it can be experienced close to the inferior medial collateral ligament attachment, all the way down to the navicular area. The Tibialis Posterior tendon may slip over the medial malleolar due to tight Tibialis Posterior tendon, this action can be attributable to a weak retinaculum. Repetitive STJ pronation, causes the Tibialis Posterior tendon to elongate as the foot collapses medially, hence causing medial shin pain. Constant elongation may contribute to the development a tears and scaring in the muscle belly, and a pulling away from the tibia, causing inflammation and pain. Differential Diagnosis: Compartment Syndrome and stress of the tibia. • Deep tissue massage therapy – to break down adhesions. • Orthotic therapy to control the excessive pronation. • Low dye strapping to mimic orthotic and give additional support (short-term treatment only). Lateral Shin Pain: the patient may feel this pain when undertaking excessive running and walking activities and is mainly experienced when walking or running downhill. The biomechanical aspects of the foot may be a high forefoot valgus or fixed plantarflexed 1st ray, both of which may cause a supinatory effect. In gait, contraction of the anterior tibialis muscle raises the toes and dorsiflexes the foot. The main functions of the anterior tibialis during athletic activities are dorsiflexion through concentric contraction, and slowing the reverse movement, plantarflexion, through eccentric contraction. 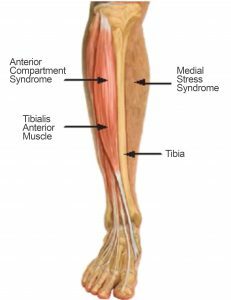 Weakness of the anterior tibialis, particularly in eccentric contractions (lengthening contraction), can cause cumulative damage to the muscle and surrounding connective tissue. Strength of the posterior muscles of the lower leg is an-other factor implicated in both anterior shin splints and posterior shin splints. Though it is less common in the case of anterior shin splints, a lack of support from the calf muscles may contribute to shin splint pain. (see Fig. 1). • Strapping with a valgus wedge added for short term relief. • Orthotic therapy (and the addition of lateral wedging ) to control the supination. 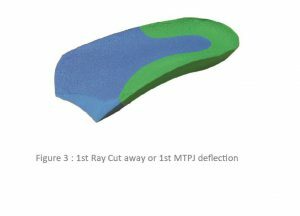 • Add a 1st ray cut-away to the orthotic if the patient has a plantarflexed first ray (see Figure 3). Anterior Shin Pain: the patient normally feels the pain after running or walking and is mainly associated with uphill and downhill walking and running. Biomechanically, it is related to supination at heel strike and then pronation at the mid stance to toe off stage. During the gait cycle the Tibialis Anterior muscle acts as an inverter of the foot to allow for ground clearance at late swing phase. 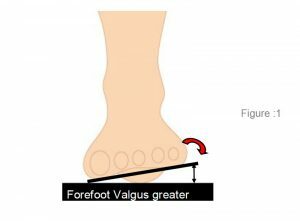 If there is a forefoot valgus of <10˚ (less than) the foot will supinate at heel strike and the ground reaction force on the lateral side will then propel the foot into pronation at mid stance of gait to toe off. In this circumstance the Tibialis Anterior will elongate and cause tearing to occur at the muscle belly especially on the lateral tibial crest and cause adhesions. In short, during swing phase the tibialis anterior contracts causing the foot to invert and dorsiflex. 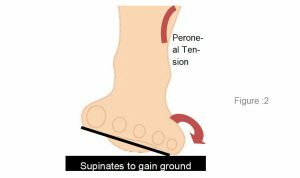 At lateral foot strike the ground reaction forces propel the foot into pronation in early midstance to late midstance, causing a sudden pull of the tibialis anterior. This firstly causes a shortening of the tibialis anterior, then a sudden lengthen-ing of the tibialis anterior from midstance to the toe-off stage. • Deep tissue massage at the Tibialis Anterior and along the lateral tibial crest. • Acupuncture on the adhesion to help break down scaring. • Orthotic therapy – not only to control pronation, but also the supination at heel strike and the a forefoot lateral wedge to treat the Forefoot Valgus if apparent. 2 Clement D., Taunton J., Smart G. (1981). “A survey of overuse running injuries”. The Physi-cian and Sports Medicine 9, 47–58. 3 Cox J. S., Lenz H. W. (1984). Women midshipmen in sports. American Journal of Sports Medicine, 12(3), 241 – 243.